Christopher Columbus here reporting on the run to St Michaels on Thursday and shore excursions on Friday. The cruise down to St Michaels was 56 miles of surprises. Still Waters II decided it was time she gave the crew some more onboard training. When starting the main engines the port engine decided not to start. The skipper noticed that the battery voltage was very low. There is a parallel switch that allows the port engine to start from the starboard battery bank. It took a couple of tries to figure out how the switch works, but the port engine finally started. Then pulling the anchor was a bit more challenging than usual, but in the end the anchor finally lost and got back in its stowed position. About 1000 the mate reported that the refrigerator was not working and the inverter was not showing that it was working. She took the wheel and the skipper went below to troubleshoot the electrical problem. The inverter was completely ‘dead’ and not converting any DC to AC. The skipper checked the batteries and they were at 12.5 volts and being charged by the alternators. The skipper got the smarts book out on the inverter and found a paragraph that stated that if the batteries drop below 10.5 volts that the inverter auto shuts itself off. What a nice inverter. The inverter will auto restart once the batteries are back to 13.5 volts. The skipper decided to start the generator to charge the batteries and run the AC loads while underway. With the generator carrying the AC loads and charging the batteries, the inverter sensed the battery voltage greater than 13.5 volts and came back to life as promised. The skipper was making 1 hour engine and generator checks to ensure all was working well. This gave the mate some valuable time at the wheel. The crew arrived at Piney Narrows at 1425 just in time for the 1430 Draw Bridge Opening. Click on the photo below to watch the bridge open and Still Waters II pass through the bridge. After making the bridge passage and navigating the thin line of deep water the skipper turned the wheel back over to the mate to go do the 1500 engine checks. Before going below the skipper noticed a big boat approaching fast. He decided to stick around a few minutes for the boat and wake to pass before going below. The skipper watched as the boat passed because he knew there was not much room and the boat looked to be over in shallow water. Sure enough the big fast boat came to an abrupt stop. The skipper noticed that the fast boat captain tried to put the engines in neutral, but it was too late, they ran their brand new fast boat aground. The skipper remembered Captain Geoff’s comment about 1K for every knot. The big fast boat just learned that experience is expensive. As the crew approached St Michaels they called ahead for their docking instructions. The dock master advised that they would go bow first into a pier with port side tie and a sailboat less than two feet clearance on the starboard side. 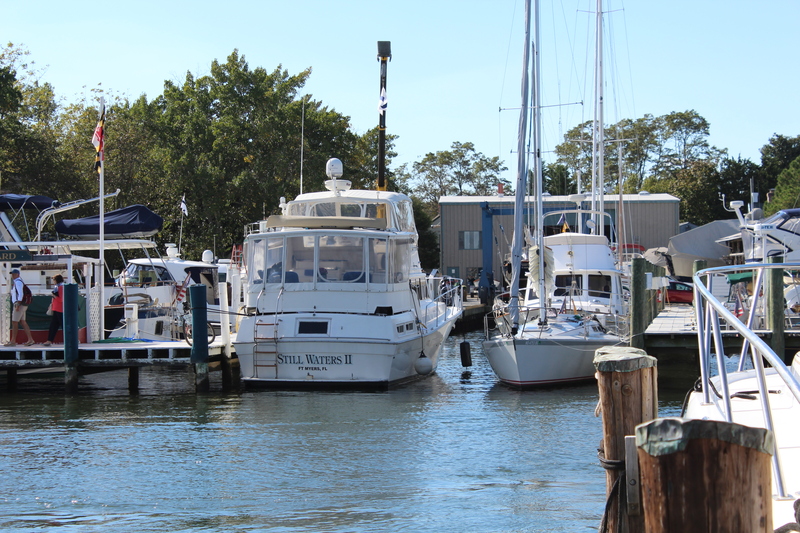 As they approached the dock, the sailboat owner heard the engines and stuck his head out to watch the skipper dock. Luckily there was very little current and the wind was blowing straight down the boat. The mate got a breast line over to the dock hand quickly and then got the bow secured so we would not be bumping into the sailboat. The skipper took a big deep breath and turned the engines off. Wow, what a strange day. St Michaels gets its name from the church named “Saint Michael’s” that was the first building in about 1677. The town grew around the church and eventually took its name. 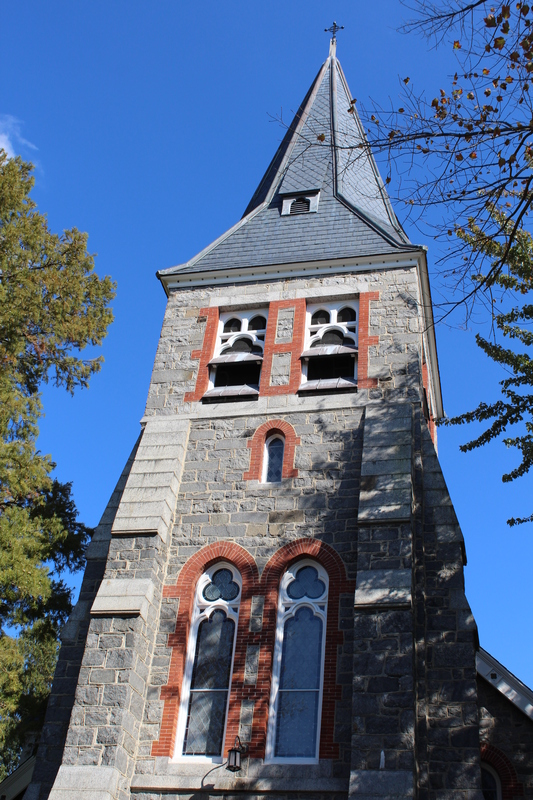 The church bell rings every 15 minutes, and on the hour rings longer with an old hymn. St Michaels advertises itself as the town that fooled the British. 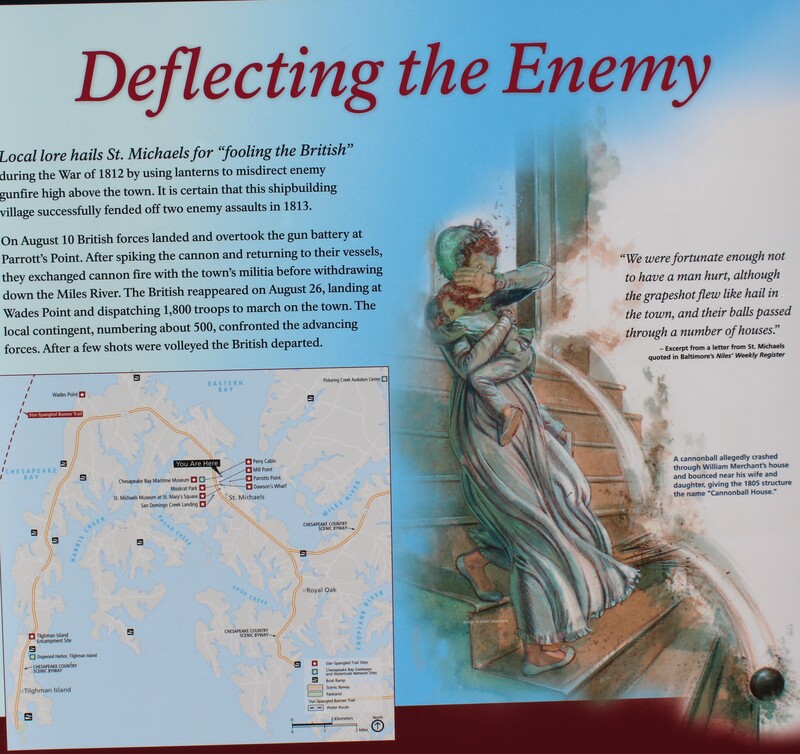 As the story goes, in the morning hours of August 10, 1813, the British attacked St Michaels to destroy the 7 shipyards. Legend has it, that the residents knew of the attack so they put their lanterns in the tree tops and blacked out the rest of the town. 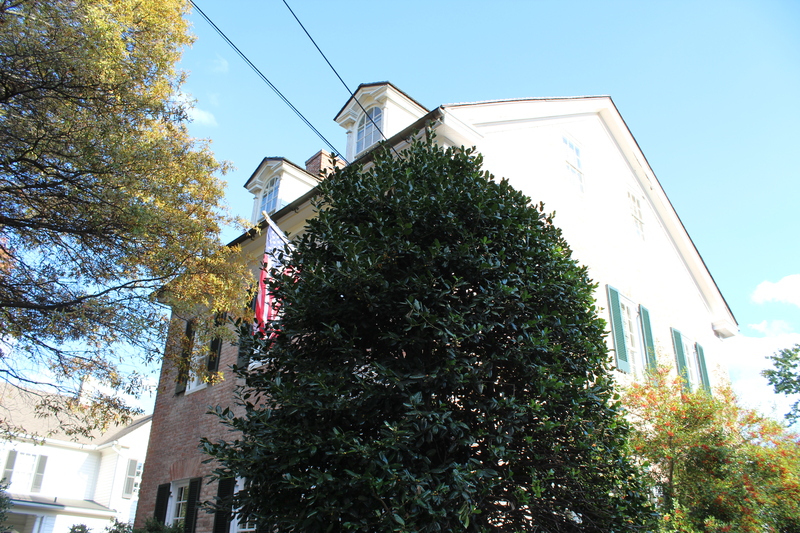 The British only hit one house with the rest of the cannon fire over shooting the town. The one cannon ball penetrated the roof and rolled down the stair case as Mrs. Merchant carried her young daughter down the stairs. The home is still a private residence. The crew decided to visit the Chesapeake Bay Maritime Museum. The museum covers 18 acres explaining how people live, work, and play on the Bay. The museum has 14 separate buildings and exhibit areas. 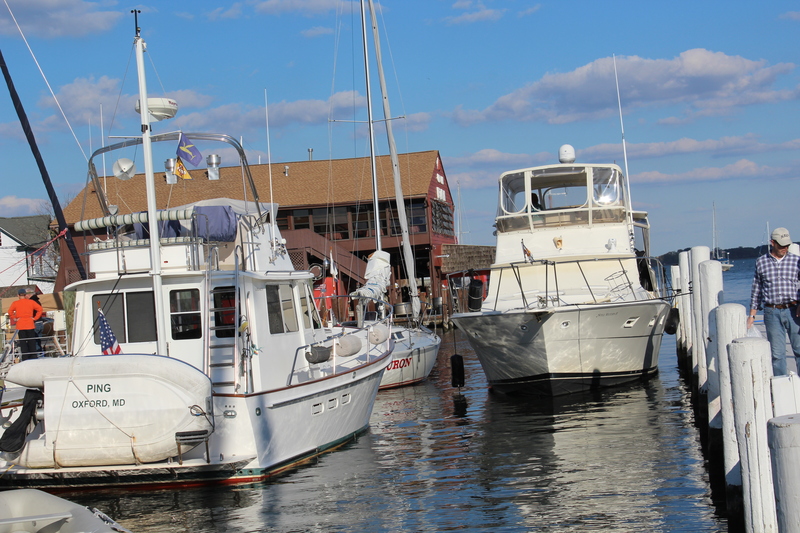 One of the exhibits is a floating fleet of Chesapeake Bay watercraft. 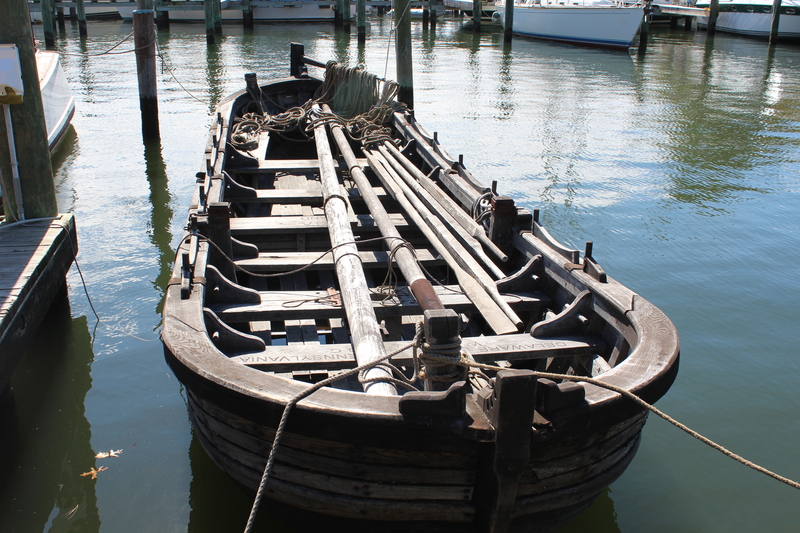 One of the boats was a replica of Captain John Smith’s boat that he used in 1608 to explore and map the bay. 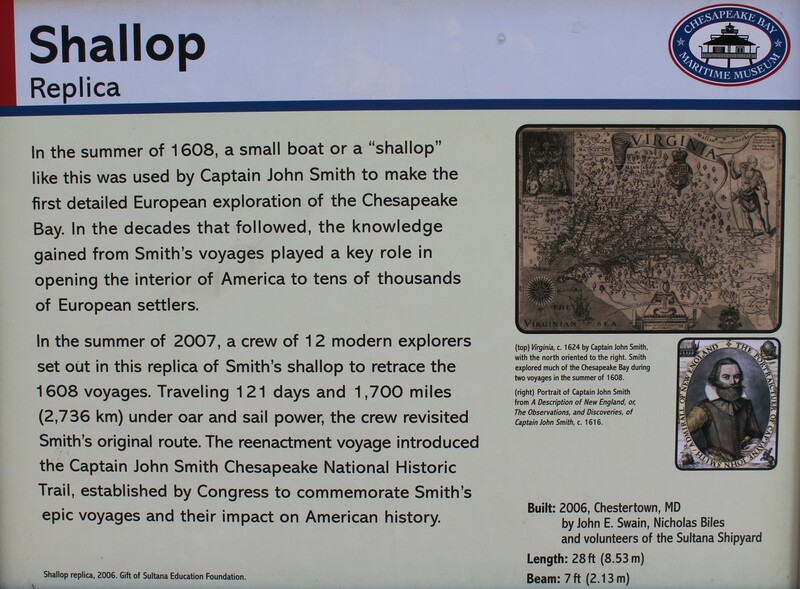 More amazing is that Captain John Smith was in the Bay History Building giving tours when he noticed the skipper. The Captain said he was ready to return to Jamestown so he is rejoining the crew on their southerly run to Norfolk. A few pics around town. So long, Capt. Columbus! Welcome back, Captain Smith! Is the electrical system okay?